Pregnancy is one of the most wonderful, happiest and essential periods in a woman's life. It is indeed a blessing; however, the majority of women experience considerable changes in their body especially the size of their belly. The most common body complaint is the emergence of back pain, and as the baby continues to grow, it can become even harder to sleep comfortably. Using multiple pillows to comfort your belly, back and neck can be difficult especially if you move throughout your sleep. To help expectant mothers we have created a guide to show you the best pregnancy maternity pillows on the market designed to help you sleep in ultimate comfort. PregnancyPillows are a UK brand that specialises solely in pregnancy pillows, so you know they know what they're doing. This award-winning pregnancy pillow is in a U shape and features an ergonomic design to contour around your body as you sleep on your side. Maintaining this position positively affects the baby by improving blood and nutrient flow. The design of the pillow aligns the spine, hips, shoulders, and supports the head, bump, back and hips simultaneously. The pregnancy pillow has been specially crafted and designed to encourage you to sleep on your left side which is recommended from the second trimester and beyond which helps the baby to get into the best position for delivery. The pillow also prevents you from rolling onto your back during your sleep as this can reduce blood flow to both the mum and the baby. The bottom of the pillow also lightly elevates your legs while reducing the pressure on your back and bump. A unique Lavender aroma coated fabric is used to cover the pillow. For hundreds of years, Lavender has been used as a sleeping aid to help people get to sleep quicker. Provides a high level of support and comfort to reduce the pressure on you joints. The pillow is extremely quiet so will not wake you if you move throughout the night. Ideal for preventing and curing existing pains and aches. This product is our pick as the best pregnancy body pillow that is available to buy. Not only is it extremely supportive and long lasting but it also is made with Lavender infused fabric to take your sleep experience to another level. Although this has been a hit with the customers, if Lavender isn't your thing then you can purchase the same pillow, but without the fabric being, Lavender infused. Sanggol is a UK manufacturer of maternity products, and one of their flagship releases is a high-quality pregnancy pillow. This uniquely designed pregnancy pillow contours the natural shape of the mother to provide complete support for the whole body throughout the entire nights' sleep. It's a genuinely multi-use pregnancy pillow that can be used for supporting the mother while sleeping and is often used post pregnancy by the mother for nursing and breastfeeding. The pillow filling is made up of hollow fibre material that provides a firm enough feeling, so the mother feels supported while also feeling extremely comfy. Due to its large size, the pillow provides total body support from head to toe including the back, belly and shoulders. Can provide support for other illnesses and issues such as Carpel Tunnel, Gastric Reflex and Congestion. Filled with Hollow Fibre material to provide support and firmness which also comfortably contours to you body shape. You will not be dissatisfied with this product, and you can see how much has gone into its design and manufacturing. The majority of the product reviews are extremely satisfied by the product especially pregnant women who were already having a hard time sleeping. This U shape pregnancy pillow has been designed to suit all body shapes and sizes as it cradles your body providing the support you need to have a comfortable sleep including the more exposed body parts such as the back and belly. Its Hypoallergenic qualities mean you are safe from any allergy flare-ups while you use the pillow. The filling is a spiral hollow fibre material that contours your body so you feel secure throughout your entire sleep. It can be used for both sleep support and breastfeeding, while some users have used the pillow to aid their recovery for other issues such as fibromyalgia. The pillowcase is also machine washable, so even though pillows can have bacteria build very quickly, you can easy and quickly clean and dry the pillow. This pregnancy pillow will support your body where you need it most, and it will last several years meaning that you can use it for more than one pregnancy cycle. Its affordable price makes it accessible for most expectant mothers. Because of its effectiveness, the pillow has many users who aren't even pregnant but have other body issues such as back injuries, shoulder issues or recovering from surgery. The U shape Pillow Pleasure full-body solution is perfect for supporting your bump and other vulnerable areas of your body throughout your sleep. This is not just for sleeping but also for snuggling up on the sofa. With its hypoallergenic features and its 100% Cotton case means that the cover stays cool to touch while keeping your body warm and supported where you need it the most. It has also provided pain relief for many customers for a large number of different conditions including osteoporosis, Arthritis, back, shoulder and neck pain. The pillow also has a removable, washable cover so you can keep the pillow clean with ease and regularly wash it. This product has been around for many years and shows no signing of disappearing from the market and has built up a large number of loyal followers and users who have experienced great results by using the pregnancy pillow. The pillow is well stuffed and firm to provide you with all the support you need in all the right positions. By now you know the difference that a top quality pillow can have on your sleep quality, and you can rapidly go from sleepless nights to a relaxing nights sleep. Bedding Direct is a UK based company with the UK manufactured pregnancy pillow range, that provides exceptional support for the entire body which is great for expectant mothers. The full body pillow will provide ample support for your growing belly while also protecting and supporting your back, hips and neck giving you a great nights sleep. The pillow is also hypoallergenic so it will not cause any allergic reactions so you can keep your baby even safer from any adverse illnesses. Bedding Direct has made a conscious decision to make this pillow oversized so it will provide every part of your body with the support it needs throughout your sleep so you will no longer wake up in the morning with aches and pains, but you'll be bursting to attack the day. It will make your pregnancy slightly easier and more comfortable to deal with, so you can enjoy the happier moments. A pregnancy pillow is an enlarged pillow designed for expectant mothers. They are usually larger than traditionally-sized pillows which allow for them to provide a healthy level of support to your whole body including your neck, back and belly. It can help alleviate and prevent lower lumbar pain, posterior pelvic pain while allowing you to get a higher quality of sleep which will only benefit you and your baby. The pregnancy pillow market has developed massively in recent years, and there are now many different types and shapes of a pregnancy pillow. While they all have the main aim of providing comfort and reducing aches and pains, the final choice you make will depend on your individual preferences and requirements. Full body pregnancy pillow was created so that they wrap around the entire body of a pregnant woman including the bump. This provides a significant level of support and comfort. Full body shaped pillows are usually around 5-6 feet long so that they are big enough the majority of women. A U shaped pregnancy pillow is the most comfortable type of pregnancy pillow and proved additional support to the belly and back and is ideal if you're moving into the final stages of your pregnancy and your stomach is at its largest. In one piece unlike trying to position several individual smaller pillows. Affordable, but still the most expensive type of pregnancy pillow. The C shaped pregnancy pillow allows the user to lie in a riding position, with the base of the C between her legs while placing her head on the top part of the pillow. The back is then rested on the curve of the C shape which eases the pressure and allows her to sleep comfortably. Just like the U shaped pregnancy pillow, it also provides support to the neck and belly. They are large shaped which can be a problem if you don't have much space. A wedge pregnancy pillow is often referred to as a maternity cushion and functions exactly as its name suggests. You wedge the cushion either to support your back or belly to bring additional comfort to improve your quality of sleep. underneath a regular pillow to raise the level of your head, which helps to reduce heartburn and reflux. Full-length pregnancy pillows are designed to be as long as the users body and are rectangular and straight. This shape helps them to support the whole body which means that you will not need any additional pillows to support you. Some full-length pillows are fixed into that position, whereas some are flexible and can manoeuvre into your desired shape. Studies have conducted which have proven that around 75% of pregnant women experience back pain at some point during their pregnancy which negatively affects their ability to sleep. This is why even doctors recommend that pregnant women should purchase the best pregnancy pillow on the market to help them sleep at night. It has been reported that in 15% of pregnant women, back pain becomes so severe that it begins to interfere with their normal daily routine which then stops them from carrying out their regular tasks. It's why a pregnancy pillow is so vital as it allows a pregnant woman to sleep in complete comfort and peace. Medical research has also led to professionals recommending that when women enter their final phase of pregnancy, they should sleep on their left sides to benefit the baby. Side sleeping is tough to do for the entire night, but with a pregnancy pillow, it's easy. A particular portion of pregnant women finds every sleeping position uncomfortable and painful This lead to many sleepless nights which affects your mood throughout the day leading to grogginess and irritability. If you force yourself into sleeping into an unfamiliar position, during pregnancy, this can lead to a whole host of problems including carpal tunnel, sciatica, gastric reflux and heartburn. This is the main benefit of using a pregnancy maternity pillow. Throughout your pregnancy, as you get bigger and heavier when the baby is growing, the pressure will increase on specific body parts and buying the best maternity pillow will help to reduce this pressure and pain especially through the prone areas of the back, neck, shoulders, belly and hips. All pregnant women will agree when I say that sleeping can be a tough task, but a pregnancy pillow with the right shape and firmness can promote relaxation and comfort. This will allow you to sleep for longer and get to sleep quicker. It is recommended that pregnant women adjust their sleeping position and sleep on their side. This improves the blood circulation; however, this position can be difficult to sleep in when pregnant but a pregnancy pillow allows you to stay comfortable sleeping in the side position. When you're pregnant, you need to take more precautions and be more careful with your health to keep your unborn baby safe. Unlike traditional pillows, the majority of pregnancy pillows are hypoallergenic to ensure that you avoid allergy flare-ups. No matter the position that you prefer to sleep in, a pregnancy pillow will aid and allow you to sleep in that position while improving your comfort levels ensuring that you wake to feel refreshed and ready to complete your daily tasks. Pregnancy pillows are often used post-pregnancy throughout the breastfeeding phase, and many use it for the odd night they sleep with their toddler. Be sure to purchase a maternity pillow with a removable cover because they're machine washable so you can regularly wash them as they get dirty and dusty. It will prevent the build-up of dangerous dirt that could cause allergies or infections. A removable cover also allows you to replace it with a new one when the existing cover becomes old. It's highly essential that you check that your desired pregnancy pillow is hypoallergenic. The last thing you want to do during pregnancy is to trigger an allergy. Purchasing a hypoallergenic pregnancy pillow will lower the risk of your baby contracting diseases due to the mothers' allergic reaction. 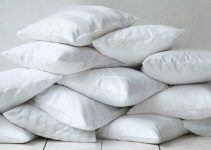 Several common pillow filings are used, and these filings will affect several factors such as longevity, price, firmness, shape etc. The first common choice of filing is polyester fibre that is soft and will remain quiet throughout the night no matter how much you change position. Memory foam is a strong choice as it will conform to any changes in the position of your body and mould around you. Natural and organic filings are eco-friendly and will contain hypoallergenic qualities. You should consider the size dimensions of the pregnancy pillow that you're interested in buying. First of all to ensure that it will fit on your existing bed, and also if you share a bed with a partner that you can both still fit. This also comes down personal preference whether you want a large pillow or a slimline pillow. We recommend that you purchase the pillow that provides full body support from top to bottom including your head, neck, belly, back and leg area. Take into consideration which parts of your body already hurt and ensure you buy a pillow that cushions these areas. The most effective pregnancy pillows are lightweight especially if you plan to move it from room to room ideal for mothers who throughout the day nap in the living room, but move to the bed during the night. During your pregnancy, energy is precious, and you don't want to waste it moving a heavy object to get comfortable. A rule of thumb, most pregnancy pillows are lightweight so you shouldn't have anything to worry about. Your preferred sleeping position should play a part in the pregnancy pillow that you purchase. Do you sleep on your back or your side? If you prefer to sleep on your side, you should choose a U shape or C shape pillow that will provide support to your belly. All maternity pillows are affordable, so this shouldn't play a massive part in your buying decision. Your main aim should be to find a pillow that provides the best level of comfort to support you and your developing baby. Don't risk your comfort to save a couple of pounds. Finding the best maternity pillow can be difficult especially if you decide to buy one when you're already experiencing some form of pain. It's important to remember that a regular full nights sleep is a necessity for a healthy pregnancy and you must put yours and the baby's needs first. When you wake up after a full 8-hour sleep, and you feel refreshed, that's precisely how the baby feels inside you because the lack of movement makes the baby relax. A happy mum makes a happy baby, and a pregnancy pillow will put you on the road to happiness. A happy mum makes a happy baby and a pregnancy pillow will put you on the road to happiness.